Milia are very common particularly on fine skin. A milium is a small cyst containing keratin (skin protein); they are usually multiple and are then known as milia. 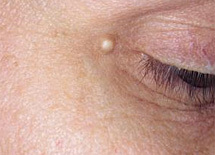 These harmless cysts present as tiny pearly-white bumps just under the surface of the skin. We can remove them with a milia needle which is a tiny one use sterile needle. It is best to book a facial to prep the skin prior to milia extraction. Please request milia extraction when booking as some staff do not do it .